eBay notified sellers it will begin collecting sales tax on transactions made to buyers located in three states: Washington, Pennsylvania, and Oklahoma - but not until 2019.
eBay lags behind Amazon and Etsy, which began collecting and remitting Washington sales tax for 3rd party sellers on January 1, 2018, and also began collecting for transactions in Pennsylvania and Oklahoma this year. 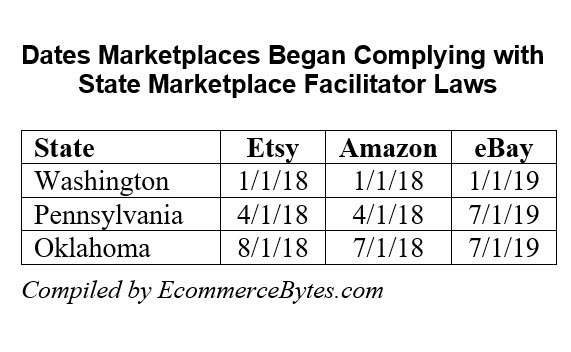 eBay didn't give a reason why it is not already collecting sales tax on transactions in those states under their Marketplace Facilitator laws, but presumably it's because unlike on Amazon and Etsy, buyers don't pay eBay - they pay the seller. But that's changing as eBay rolls out managed payments. eBay said sellers cannot opt-out of selling items into Washington, Pennsylvania, and Oklahoma: "There are no opt-outs for selling items into the states listed above, or out of eBay automatically collecting sales tax for items shipped to the states above." The implication was that sellers might wish to avoid dealing with buyers in those states, although many small sellers actually favor the marketplaces handling sales tax on their behalf, especially those who sell exclusively on marketplaces. eBay also offered this advice to sellers in Thursday's post: "Prior to these dates, please continue to collect and remit tax in these states and comply with any other applicable requirements they impose." But keep in mind it may be better left to sellers to determine if they are obligated to collect any state's sales tax. eBay also announced it partnered with Avalara and TaxJar, which provide sales-tax services to online sellers, but didn't disclose if it benefits financially from referring sellers to those companies. We recently tackled the sales-tax issue in this month's Update newsletter, "Online Sellers Stumped over Sales Tax Collection" (September 8, 2018). It has more information, but no easy answers for small and medium sized sellers. You can read eBay's full announcement here. 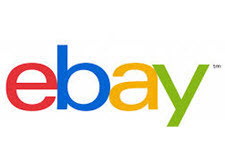 It may also behoove sellers to review eBay's tax policies, found on this help page. Update 12/29/18: Be sure to see that help page for the latest information! I don't really understand why the marketplaces are collecting sales tax for the sellers on a voluntary basis. If they left it to the seller to collect then the collection of sales tax would be completely unenforceable and would land well within the judges findings about small sellers as part of the over turned quill verdict. BUT if the mega marketplaces collect the sales tax then you set a precedent that enforcement is possible though the marketplaces rather then the small seller justifying the sales tax charges in the big business portion of the verdict that led to the overturning of quill. Seems like the big marketplaces should have stayed out of it in favor of letting laws be written to exempt small business that do low volume per state. I realize the reason is because the marketplaces are getting paid directly (with the exception of ebay who is going to start processing their own payments).....but maybe ebay should keep payments separate and give them a massive edge over the competition. Sales tax being added to ebay sales will be the straw that breaks the camels back. I don't think there is any way ebay buyers are going to spend up to an extra 10% sales tax on top of ebays 10% FVF plus 3% processing fees, ever increasing shipping fees, seller profit, and actual product costs. Even if sellers will be hands off sales tax the buyer will still be giving that consideration at the time of purchase. Same here. It's already tough sell with two pigs (eBay and PayPal) sticking their snouts in my business. I don't need Pennsylvania being a third. .... maybe Im wrong - so please correct me if I am. BESIDES the obvious point(s) above (eBays prices being less competitive due to taxes) .... IF taxes HAVE to be paid/collected - are we not better off having eBay do it and having our NOT be involved ?????? ebay would LUV to collect taxes...they'll likely get a 10% take of the tax, just like that 10% take of shipping. It is being determined by the individual states. That is why as of this time it is just 3 states Ebay will be doing this for. But more states will join in and pass laws to required this. Where did you get that information from? Does it apply to Etsy and Amazon too? Please provide links so we can all review the information. I don't think the states would allow marketplaces to dip into their sales tax revenue, and I don't think they would approve of marketplaces charging a "commission" on a pass-through tax. HOWEVER,...Amazon charges sellers 2.9% of each transaction in order to collect sales tax. In other words, if you "choose" to use Amazon's sales tax tool, you must pay out of your own pocket. I was serious, I see you aren't. Amazon auto charges sales tax on the appropriate items sold for me. However I am not paying a fee for them to collect those taxes, at least not that I can see anywhere unless I'm looking at something wrong, which is always possible. Now PP charges a 2.9% fee on the entire amount received plus their 30 cent transaction fee. It was my understanding that most states are focusing collecting sales tax on much larger online sellers, such as $10,000 worth of sales in a given tax year quarter in their state. So for most of us, even if you sell $100,000 worth of merchandise per year, you may not sell over that given amount to any state. Can anyone say if eBay will still collect sales tax for smaller, more hobbyist or weekend sellers that won't even come close to any of these monetary thresholds? Can anyone say how Amazon and Etsy does it? Do they all collect sales tax regardless of the amount you sell? Yes, they do want the larger sellers on the internet PLUS marketplaces such as Ebay, Etsy, Amazon, ecrater, etc. By making marketplaces responsible, they can easily collect from small internet sellers out there because it is the marketplace they hold responsible. So...will they collect state AND local taxes? Imagine that nightmare and the code involved. You think Wenig wiil do that for nothing? eCrater does not have their own payments system such as Etsy, Amazon and, soon, eBay. Since no money flows through them I don't see how they would be required to pay taxes on behalf of their sellers. Neither does Ebay. The payment program they just launched only covers a very small percentage of sellers. And when they plan to start the sales tax collection, the payment program won't be expanded until several months later. On etsy when we sell to one of these tax States, the tax is automatically added to the customers total, no opt out for those states or the tax they add. if a customer pays with etsy pay, the tax is deducted before they deposit, to our bank, if a buyer pays with PayPal, the tax is added to our PayPal account as part of the sale total, then it is added to our esty bill, like a fee. I'm almost sure ebay will turn this simple procedure into a nightmare, or somehow try to weasel out of it, and claim their famous "we're only a venue" act to make sellers remit the tax on their own..
YOU CAN NOT "PASS LAWS" to collect ILLEGAL TAX. It must be done with an Amendment to the Constitution. IGNORANCE HAS NO PLACE IN AMERICAN COMMERCE. @Marie - Since you last post was directed to me, I have to say I don't understand the point you are trying to make. Are you saying that eBay is going to take the taxes from sellers who aren't in their payments program yet? They don't "take it from the sellers" nor does Etsy or Amazon that currently pay the tax for the sellers. They auto add the appropriate amount to the buyer's invoice. So when the buyer pays, they are paying the sales tax. Etsy and Amazon then withhold the tax paid by the buyer and the seller never sees it in their deposit account. As for Ebay, well it is Ebay and we will just have to wait and see how they apply everything. But either way, it is not an additional expense for sellers, the buyers will be paying the taxes they owe to their states. As many of us know, various states may have different sales tax rates for different areas inside the state. I'm not sure how each state will be determining this. If they require the marketplaces to track each different tax rate within any given state or if they are allowing one flat rate for the entire state. To my knowledge this new law isn't for "local taxes", but for state sales tax. I could be wrong as I don't know that to be a fact. Some areas have their local sales tax included in their state sales tax rate. Your question is a good one, maybe Ina knows the answer. @Marie - Then why did you bring eCrater into the discussion when I have received no notices that they will be involved in the tax collection process, nor have they posted anything related to tax collection on their discussion boards? Since they don't have a process by which they can collect taxes on sales, and they are truly just a venue, do you have credible knowledge that they will be billing us for taxes on sales to those states? Because if they can make Ebay charge and remit the sales tax, then other sites that do not process payments could be next. They are going after marketplaces and not individual sellers. I did not mean to upset you. I too originally thought they could only do this with sites that had their own payment processes. But if they can make Ebay do this now and Ebay did not qualify the announcement to be for only those in the payment process program, then they can do it to other marketplaces as well.